An international organization recently released a ranking of the 50 most dangerous cities in the entire world. Four of the world’s most dangerous cities are located in the United States; Detroit, Baltimore, St Louis, and New Orleans. As Mitch Landrieu’s two terms as New Orleans mayor ends, he leaves behind a city characterized by rampant crime, unsafe streets and neighborhoods and an understaffed, unsupported police force that had to be augmented by state troopers. In addition to its unmanageable crime problem, the city suffers from high unemployment, a decaying infrastructure, inadequate drainage, sidewalks and streets with pot-holes and cave-ins, a dysfunctional Sewerage & Water Board, and a failed educational system. This is the real New Orleans; a far cry from the mythic tourist city ballyhooed by the Convention & Visitors Bureau. Dire conditions coupled with the lingering effects of Hurricane Katrina have caused many residents to depart the city. But the national media and even local New Orleans media avoid mentioning the city’s real problems. Instead they continue to praise Mayor Landrieu’s year-old removal of Confederate monuments. Landrieu knew that tearing down Confederate memorials would gain him plaudits from the establishment media, and he hopes the media coverage he receives might lead to a national political office. Consequently he didn’t risk a city-wide referendum that might have rejected the removals and denied him the media coverage he sought. Shamelessly, he covertly removed the monuments in the dead of night without advance warning. A reputable mayor would not have taken such an ill advised action without community approval or plans for disposal or replacements. But Landrieu’s concern is his future political career not the welfare of New Orleans. He’s dumped that dilemma on his successor. – Its doubtful that Mitch Landrieu’s hopes for a presidential nomination will materialize but he’s certainly getting the media attention he craves. Maintaining that Confederate monuments were erected to “intimidate” minorities is a common theme with the establishment media. Actually, the vast majority were constructed during the period from roughly 1890 to the end of World War One. This was a time when Civil War veterans were dying of old age, and their descendants sought ways to commemorate them. There were parades to honor these elderly Civil War veterans, and a Confederate Memorial Day was instituted; long before the National Memorial Day was created. The Robert E. Lee Statue on Lee Circle in New Orleans was constructed not long after the War Between the States ended. The official dedication took place on George Washington’s birthday; February 22, 1884, during the city’s carnival season. Regional dignitaries, former Confederate officers and local residents were in the crowd assembled for the honoring of General Lee who had passed away only a little over a decade earlier. The public esteem for Lee was such that his funeral was even attended by prominent politicians from the North. The monument in New Orleans was only one of the nation’s numerous tributes to Robert E. Lee over the years. MSNBC’s Joy Reid made this bizarre claim about Confederate monuments: “The idea of putting up monuments actually didn’t happen right after the Civil War. It happened during the 1960s.” Ms Reid and other TV news celebrities obviously know nothing about history, so they actually maintain that the monuments were erected during the 1960s Civil Rights era! Very few Southern monuments were erected in the 1960s. But some extremist groups appropriated the Confederate Flag and, as a result, the establishment media maintains that Confederate symbols cannot represent Southern heritage and pride. The establishment media’s contention that Confederate symbols always imply something malicious brings to mind the Israel Philharmonic Orchestra’s refusal to play compositions by Richard Wagner. The ban on Wagner was based on the fact that his music was used as a prominent musical background for Hitler’s Nazism. Israel eventually changed its policy realizing that by excluding Wagner, simply because his music was favored by Nazis, they were precluding an essential element in the repertoire of classical music. In a ludicrous attempt at justification, Mayor Landrieu claims that it was Confederate monuments and not Hurricane Katrina, unemployment or dangerous neighborhoods that caused the massive exodus of residents. In his words:“The cultural and economic and the spiritual loss to this city for having those statues up that have run people out of the city … The great migration that sent some of our best and brightest to places across the country that we don’t have the benefit of has been incredible.” Although Mitch Landrieu often misrepresents facts for political gain, its hard to believe that even he would make such a ridiculous claim. Its even harder to understand why local New Orleans media let him get away with it. Of course, New Orleans is not known for competent mayors who conduct themselves with integrity. Mitch Landrieu was preceded in office by Mayor Ray Nagin, who is currently serving prison time for wire fraud, bribery, and money laundering. Landrieu’s mayorship will be succeeded by LaToya Cantrell, whose tenure on the city council is under investigation by the Louisiana Attorney General. Ms Cantrell is suspected of questionable financial dealings including charging almost ten thousand dollars of personal expenses on her city credit card. Ms. Cantrell indignantly insists she eventually paid it back but the final repayment was made only days after she qualified to run for mayor. No serious historian maintains that the War was fought to destroy the United States. And there is no consensus among historians on the role that slavery played in the War. The slavery issue has been subjected to a myriad of interpretations, each based on the political persuasion of the historian, and the era in which the history was written. And slavery was, for various industrial, technological, economic, and other pragmatic reasons, on the way out and probably wouldn’t have survived beyond the 1880s regardless of who won the War. Mayor Landrieu’s book is subtitled “A White Southerner Confronts History.” He will “confront history” by giving only the version favored by the Left. We can assume his book will demean Southern heroes and support the media hype that monuments were not erected to honor these men but to “terrorize minorities”. Landrieu is on a tour to promote this spurious book, appearing on all the Leftist media sites, even Comedy Central. As he rarely has an original thought, he is reiterating the 1960s anti-Southern slavery/racism cliches. Contrary to the impression given by the national news, there was, and is, considerable local opposition to the removal of the New Orleans monuments. Preservation organizations like the “Monument Task Committee” implored the seven member city council not to act unilaterally and rightfully demanded that the removal decision be put to a vote by the public. The council refused. Local college professors also voiced their objections to the elimination of century-old heritage memorials and an organization of black ministers, “Pastors for a Better New Orleans”, objected to the removals. The lack of a consensus over the elimination of the monuments remains, and will exacerbate the ability to agree on their replacements. 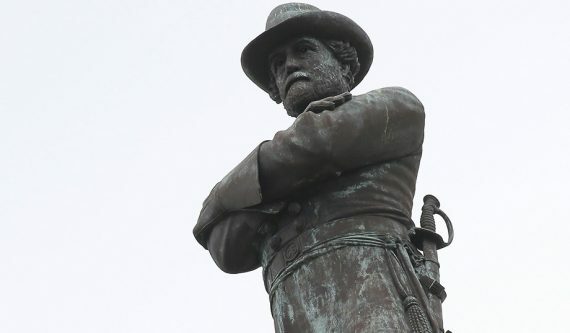 To lessen the city’s racial divisiveness, it would be prudent to restore at least one of the four removed monuments, – preferably the Lee statue. But that would require a wise discernment that the new mayor and her city council are unlikely to possess.